In a 140 acre natural chaparral area with a lot of elevation. A par 5, four par 4s, and several shorter tight holes. Plan for a 3 mile hike. A unique and exciting adventure course for SoCal. Many risk/reward opportunities. Very rugged - spotters may limit lost discs. Bring the map! Park off of Westlake near tee #11 - you can play the 19 hole course loop from there (very long walks from 19 to 1 and from 3 to 4). NOTE: Course closed when raining or muddy - call Contact for status. 23 Freeway; exit at Avenida de Los Arboles. Go east to the parking lot entrance - 2 miles on the right, 100 feet past Kensington Ave. Additional parking by tee #11 is off Westlake Blvd. about a half mile south of Avenida de Los Arboles. 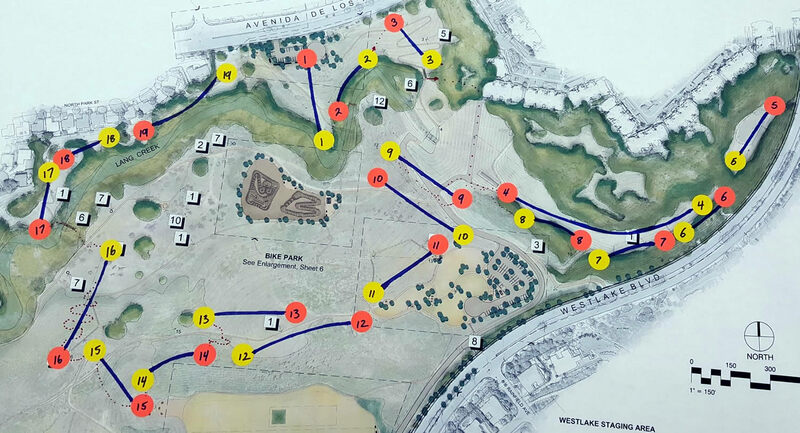 New course has lots of hills and some open holes for the long throw. I love this course and it's layout. It's busy on the weekends with busy trails, but worth a weekday or early morning round. Lots of upgrades are still in the works, but a great addition to the area. Finally a long, legit course in the LA area. Fair but not easy. Ups and downs that need a full range of shots. A good challenge of disc golf skills. Try it out and let us know what you think. The best disc golf course in So Cal? Depends on your preferences but it may indeed be the best course in the area. Bring the map - the yellow next tee pointers are cool - but navigating the course the first time may be a bit dicey. Long walk from 3 to over the dam to find #4 tee for that 1000' snaking thriller. A big walk from 19 back towards #1 also. Ups and downs a plenty over fantastic terrain. This course is an adventure! Par for 18 is probably 58.